Stageport UK, a Glasgow based production company, is using laser scanners and 3D computer modeling technology to help visualize stage productions. Using Pointfuse software, laser scanned data – point clouds – are processed in minutes to create highly accurate 3D models. These models allow production designers to conceptualize ideas within the venue scans and technical staff to visualize touring productions at different venues. Venues can use the imagery to plan for visiting companies and scans, complete with designed elements, can be shared online using Pointfuse to reduce and enhance the visualizations. The Pointfuse models can be integrated with other types of data and are compatible with mobile and desktop devices and even Virtual Reality applications. So far Stageport has created, using Pointfuse, 3D models of three different venues. With seed funding from the Royal Conservervatoire (RSC) of Scotland, a world-leading conservatoire of music, drama, dance, production and film based in Glasgow, Stageport aims to create a comprehensive database of event spaces in the UK. 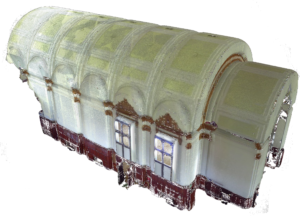 Laser scanned data, captured by Stageport and processed using Pointfuse, has also been used in a Glasgow School of Art project that centred on the potential of Virtual Reality to re-stage archive performances in cultural settings. The project undertaken by MSc student Nick Bottemley, supported by Stageport, saw the merging of the Pointfuse model with archive material found at the Pearce Institute Glasgow. This provided an excellent illustration of how Pointfuse mesh models can be applied to the archiving of significant cultural events for future generations to experience.